Behind the Concrete is a monthly snippet where we introduce a piece of architecture that has a unique design and/or interesting story. The brief: Originally a collection of old buildings and small lakes scattered throughout a 32,000-square-meter area, Shanghai-based architects Neri&Hu were tasked with transforming this property into a design-forward boutique hotel. The connective tissue of these scattered structures comes in the form of a series of walls that create pathways and courtyards for guestrooms and public spaces, while strategically placed architectural openings in these partitions facilitate the seamless transitions between the property’s interior and exterior. 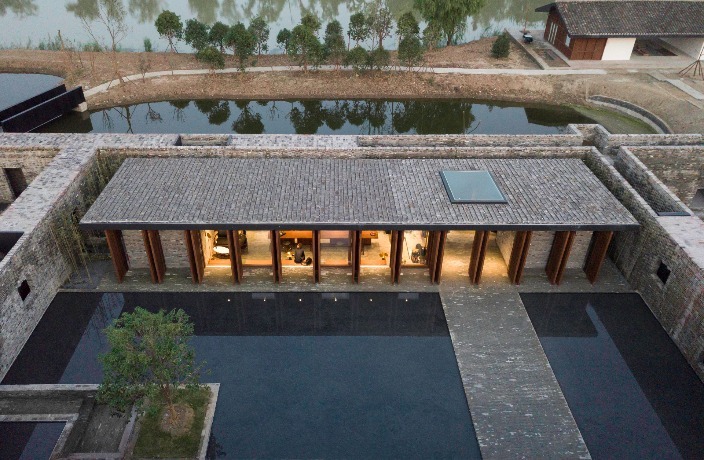 A bird’s eye view of Tsingpu Yangzhou Retreat offers a complete view of its layout with all the passageways and walls installed by Neri&Hu. Built with reclaimed grey bricks with different degrees of oxidization and shapes, these walls add layers of depth at every corner. Since the walls are designed to match the height of the original structures, visitors can’t glimpse the buildings behind the partitions from afar. This was done intentionally to allow guests to have the experience of traveling through the halls and discovering the property as it gradually unfolds. Greenery and water are used throughout the property to soften the strong contours and hard surfaces of the principal materials used for the reconstruction. The architectural openings throughout the space ease the flow from one compartment to another, while also allowing the surrounding natural landscape to be framed to further enhance the cohesion between the inside and out. The same grey bricks are also used on the walls and flooring of the interiors to enhance the cohesive design concept, while bamboo engineered wood and custom furniture and light fixtures by Neri&Hu add a contemporary touch to the spaces. Click here for more Behind the Concrete. For the Nanshanli Hotel project, Linjian Design Studio brought the surrounding greenery into the property. The Shanghai-based British architect on the rise of design consciousness and his Design Shanghai showpiece. Design firm Linehouse reimagines an elevated ritual. 'Dream' and 'maze' are two of the 10 themed rooms at this Guilin hotel. The old residential building now houses a series of small F&B and retail concepts.